The first of his three runners Thy Kingdom Come ran up to some solid recent form, to easily win a 3YO+ BM 78. Reneged ($61) and Sweet Deal ($6) were out of a place, but ran well enough to suggest they’ll be competitive in metro class. John Thompson’s life has turned the full circle, in just over a decade. He was there when Nathan Tinkler began his spectacular charge into the racing world and he was there trying to run a fifty horse stable, when an acute shortage of funds began to bite. John’s currently doing what he always set out to do - training a manageable team of horses, preferably at Randwick, for loyal owners who understand that horse ownership comes with no guarantees. Image courtesy Bradley Photographers - John Thompson at the races in recent times. John was in his mid-teens, when his grandfather Vic Thompson Snr passed away. “I remember him only as granddad and not as the respected trainer he’d been for much of his career”, said John. John’s father Vic Thompson Jnr took over the Rosehill stables, and this is where young John and brothers Mark and Glen learned the basics of horse management before and after school. The Thompsons later moved to Liverpool, when Jack and Bob Ingham developed their famous Crown Lodge training complex at Warwick Farm and appointed Vic Thompson Jnr as their head trainer. “After leaving school I worked for two years full time at Crown Lodge”, recalled John. “This is when I got my first taste of what it was like to run a large scale training operation. That came to an end when Dad and the Inghams decided to go separate ways”. Vic Thompson Jnr trained a small team in his own right for a few years, with John as his right hand man, but the younger Thompson was keen to spread his wings. After a total of six valuable years with his father, he took up a foreman’s position with prominent Randwick trainer Bill Mitchell. “General Nediym was there when I first joined, along with a couple of my favourites Dignity Dancer and Kenwood Melody”, recalled John. “I took Dignity Dancer to Melbourne when he won the treble, Alister Clark, AAMI Classic and Australian Guineas. Great thrill”. John was friendly with Matthew Smith, who had been long time foreman for Bart Cummings, but was about to begin training in his own right at Warwick Farm. John successfully applied for the job and went on to spend eight very happy years at Leilani Lodge. “Bart’s attention to detail was amazing. He was always around the stable and nothing escaped his attention”, recalled John. “He took a keen interest in the feeding of his horses and was a fanatic on the quality of the feed. He would have the oats weighed as a matter of course, and would send samples away to be tested for protein content. If the current batch wasn’t good enough he’d find another supplier”. John Thompson was actually supervising fifteen of Bart’s horses at the Warwick Farm barrier trials when he received his first phone call from Nathan Tinkler. “For a start I thought it was a friend having a joke with me, and I rather rudely told him I couldn’t talk at that time”, recalls John. “He rang again later and said he wanted to fly me to the Hunter Valley for a face to face meeting. That meeting went exceedingly well and he made me an offer I simply couldn’t refuse”. John suddenly found himself in a Warwick Farm barn with around 120 horses to supervise, while Tinkler was organising stables in Melbourne, Adelaide and the Gold Coast. When the dust finally settled, he was relocated to Randwick with a team of 50. At the time of this restructure, Tinkler had horses spread between fifteen trainers. The Patinack project lasted around eighteen months, during which time the winners flowed. In one season John finished third on the Australian trainer’s list behind Peter Moody and Peter Snowden’s Darley operation. In the same season he was also Australia’s leading trainer of two year olds. 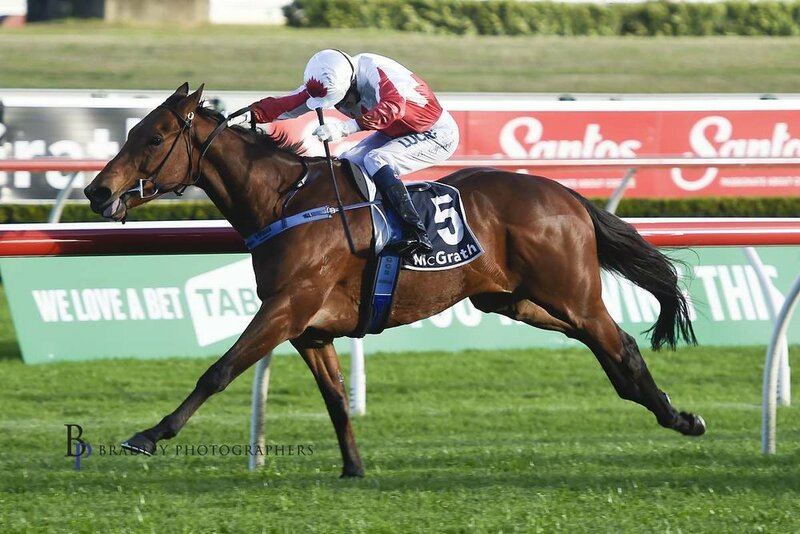 Patinack won the Australasian Oaks with Small Minds, the Tatts Tiara with Pear Tart, and the Coolmore Stud Stakes with Nechita - all at Group 1 level. He has never forgotten an unpleasant experience he encountered on his first trip to Melbourne as Patinack’s head trainer. “I ran into a couple of high profile Melbourne trainers who had previously trained Patinack horses and you could have cut the air with a knife”, recalled John. “One of them noticed my initials on a saddle cloth and said he hoped those initials were stuck on with velcro, because they wouldn’t be there long. It was very unsettling”. Image courtesy Bradley Photographers - John won the 2011 Inglis Classic with Pane In The Glass during the Tinkler era. Nathan Tinkler believed a constant flow of Group 1 wins would defray much of the cost of running an operation as vast as Patinack, but that simply doesn’t happen. When you’re racing at the elite level, you clash with the best horses, trained by the best trainers and ridden by the best jockeys. Overly ambitious owners should remember that Tommy Smith trained 279 Group 1 winners, but it took him fifty six years to do it. The dispersal of sixteen hundred horses at two “fire sales” in 2014, brought the era of Patinack Farm to a sad conclusion. It also brought to an end, the most difficult period of John Thompson’s life. A chance meeting with Bart Cummings and Dato Tan Chin Nam at an Inglis sale, precipitated the next exciting adventure in the young trainer’s life. “We were joined by Mr. Teo Ah Khing, founder and Chairman of the famous China Horse Club whose involvement in Australian racing is expanding rapidly”, said John. “Teo Ah Khing has been a prime mover in getting racing started in mainland China, and at this time they were buying horses left, right and centre from Australia, Ireland, and New Zealand”. John excused himself from the discussion briefly and by the time he returned Dato Tan Chin Nam had convinced Teo Ah Khing that John Thompson was the man he needed to go to China to help structure professional racing. “It was one of the most fulfilling experiences of my life”, said the trainer. “I spent two months in Inner Mongolia and had a lot to do with the setting up of a brand new racing industry. It also consolidated my relationship with Teo Ah King, for whom I still train horses”. The relationship also led John Thompson to the best horse he’s ever had the good fortune to train. He was asked to visit the China Horse Club’s agistment property on the Southern Highlands, where thirty horses were being held for assessment. “The minute I saw this Fastnet Rock yearling filly I marked her down as a standout”, recalled John. “Bart Cummings had bought her in NZ for the China Horse Club, shelling out $700,000”. Image courtesy Bradley Photographers - John with his all time favourite, First Seal. John Thompson eventually got First Seal to train and there’s little doubt she would have risen to great heights had it not been for an unusual hind foot condition, which appeared after her autumn three year old preparation. “She was winning races and mixing it with some top fillies, but was always subtly lame”, reflected John. “We investigated thoroughly but couldn’t identify a reason. It wasn’t until we did an MRI scan, that the problem was detected. She had developed a keratoma in the near hind foot - a rare, benign tumour of the horn-producing cells of the foot. It required surgery and it took her a long time to get over it. Despite her problems, First Seal retired with a record of twenty one starts, for six wins and seven placings for $1,259,000 in prizemoney. She won only one Group 1 race, but finished second in four others. She won four times at Group 2 level. She finished in front of Winx on three occasions. Image courtesy Bradley Photographers - First Seal and Blake Shinn on their way to a win in the Group 1 Flight Stakes. John’s wife Nicolle, is a daughter of former successful trainer Rod Craig who did such a wonderful job with the eight times Group 1 winner Intergaze. It’s now almost racing folklore that John and Nicolle were married the day Intergaze beat Octagonal in the Queen Elizabeth Stakes. The date was April 12th, 1997 and Octagonal was having his last race start. Intergaze actually got a few boos, when he upset a big AJC promotion to farewell the popular champion. Obviously Rod attended the wedding and was able to sneak away to hear the race on a car radio. His speech at the reception later in the evening wasn’t one of his most fluent. The Thompsons have a son Jake (21) who’s studying medicine at Uni, while Elise (18) recently finished her HSC. Neither seem to have inherited the racing blood, prevalent on both sides of their family. As 2019 settles into stride, John Thompson is training forty horses from his Randwick base, hopeful he can soon improve on his Group 1 tally of seven. He got a big kick in 2016 to win the historic Metropolitan Hcp with the imported stayer Sir John Hawkwood for Waratah Thoroughbreds. This very successful breeding and racing operation was established by businessman Paul Fudge around 2005. Paul continues to support the Thompson stable and the forty four year old trainer is hoping another Group 1 isn’t too far off. Image courtesy Bradley Photographers - Sir John Hawkwood and Blake Spriggs present John and Waratah Thoroughbreds with a Group One win in the Metropolitan. John has some nice horses in his care currently, one of which is Dreamforce who’ll return to the trials this week. The six year old was a Group 3 winner at Flemington over the Cup carnival last spring. This upcoming preparation should be his best so far. Purple Sector looked unlucky not to get away with the Listed Dulcify Quality last spring. John thinks the three year old will atone this prep. He’s also very enamoured of a lightly raced four year old mare called Wild Impact. Paul Fudge bred this mare in Japan, with a long term breeding plan in mind. Wild Impact has had only one race start for an easy Maiden win at Newcastle late last year. John says she has the X factor and will be at the races in the Waratah colours very soon. Image courtesy Bradley Photographers - John with Kathy O’Hara after a Rosehill win with Zanbagh. John harbours no grudges about the failed Patinack experiment. Nathan Tinkler was very discerning in his selection of the people who worked for him, on and off the racetrack. He had painstakingly researched the backgrounds of several trainers before offering John the very important role. Had three or four horses like All Too Hard come along in the early days it could have been a very different scenario. “What young trainer wouldn’t be flattered to receive such an offer. Who wouldn’t have jumped at the opportunity to train such beautifully credentialled horses for an operation that looked so exciting on paper”, reflects John with a sadness in his tone. “It was a tremendous compliment to be asked and a terrible tragedy that it didn’t work out”. The unshakeable constant right through the dark period was John’s care of the horses. No matter how complex the financial situation became, it was business as usual for the team - and the winners were still popping up. It would take a pretty decent earthquake to take John Thompson’s mind off his horses. His dad and his grandfather were exactly the same. Image courtesy Bradley Photographers - The bonny mare First Seal wins the Millie Fox Stakes.